Dagan - Fertility god of grain and fish. - Sumerian God. Dagan Dagon was a Fertility god of grain fish and fishing. 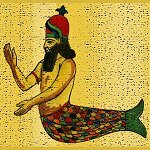 Home ¦ Divinity of the Day ¦ Sumerian Gods and Goddesses ¦ Dagan - Fertility god of grain and fish. Dagan - Fertility god of grain and fish. Dagan (Dagon), was a Fertility god of grain, fish and fishing. He is associated with fertility and procreation. He was worshipped at Elba, were he was the head of the pantheon, and Ugarit. His temple complex at Elba was called E-Mul ("House of the Star"). He is depicted as being part man and part fish. According to one tradion he was the inventor of the plough.